Moving to a new town can be hard. Being a half-vampire/half-werewolf hybrid only makes things more complicated. But that’s what confronts teenage Angela, the protagonist of the Alpha Wolf series of books by horror and paranormal author Jennifer Maimone. Making matters more interesting is the fact that Angela’s best friends are all pure werewolves. Then a local werewolf brings them shocking news: Something powerful and demonic has been slaughtering local witches… and may soon turn its attention to werewolves. 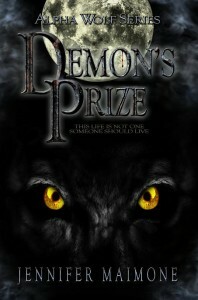 That’s the start of Demon’s Prize, the first book in the series, with the sequel A Cursed Soul coming out next year. The author’s web site has links to several places you can check out or purchase her books.